The walking tours of Miami are as wonderful and varied as is this jewel of a city. Rent a timeshare, and learn how to explore the fun aspects of Miami in Part 4 of our 6-part series on city walking tours. Miami Beach Art Deco Walking Tour. 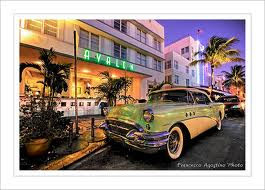 A local historian is your guide on this tour of Miami's renowned Art Deco District (see photo). Also known as South Beach, this fun area is a national historic district, and a prime example of "how Art Nouveu fused with early twentieth century industrial modernism." You'll see the magnificent architecture and colorful buildings inside and out, and learn about the many Art Deco, Mediterranean Revival, and Miami modernist styles that make up the Miami Beach Architectural Historic District. Miami Celebrity Tour. It's always fun to get to see how the rich and famous live, and they certainly know how to do it up right in Miami. This tour was developed by Kevin Doran, a long-time Miami resident, certified heritage tour guide and president of the Professional Tour Guide Association of Florida. Your guide will take you along Ocean Blvd where you'll be introduced to the cafes and shops that can find celebrities rubbing elbows with tourists, and learn about the many locations in this area that served as backdrops for TV shows, movies, music videos, photo shoots and fashion magazines. Miami Culinary Tour. There's no doubt about it that Miami is a melting pot of nationalities, and this tour gives you the chance to not only taste the cuisine of different countries, but learn about each culture at the same time. You'll hear the story behind the dishes and be introduced to the people who make them. Try Cuban Mojitos and Peruvian Ceviche, American Lobster Chili and French Cognac Crepes. Your tour works its way through delightful food offerings like a progressive dinner on a grand scale. GoCar GPS-Guided Tours®. Okay, this isn't technically a walking tour, but it's so fun it had to be included on the list. Touted as The Original Storytelling Car, these cute, bright yellow two-seater GoCars allow you to take a "self-guided" tour, with a guide. The on-board GPS directs you to lots of fun and exciting things to see and do, while a talking voice gives you interesting bits of information about each place. You can do this tour at your own pace, stopping and re-starting whenever you like. Multi-national Miami dances to its own lively beat, and a Miami timeshare rental will put you in the middle of the party with walking tours to take you just about anywhere in the city you want to go.